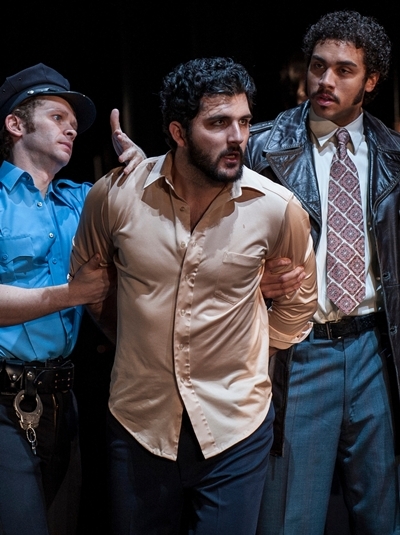 Honestly, it’s hard to know what to make of Shakespeare’s “Measure for Measure.” This darkly moralizing tale of misplaced trust, hypocrisy and lust has been called a comedy and, when that didn’t seem to fit, a “problem” play. Perhaps it should bear an asterisk. But wait. 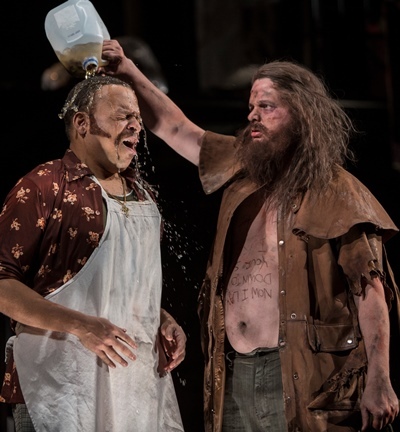 Director Robert Falls finds nothing problematic at all in taking the Bard’s comedic measure at the Goodman Theatre. His riotously funny production – if you set aside the death sentence hanging over poor Claudio and the carnal bargain offered to his sister to save him – makes plain as day what a crazy romp is wrapped in the stern exterior of “Measure for Measure.” Trust me, if Shakespeare could see this show, he would be laughing his asterisk off. Not here will you find the arch solemnity that typically shrouds “Measure for Measure,” as directors genuflect before its altar of moral rectitude. That way of thinking frames the play as dark and noble, with just a smirk of relief daubed here and there. Nah, Falls seems to declare. This is true comedy, broad satire, even a bawdy excursion into experimental theater. Goodman’s little experiment announces itself instantly. We’re thrust into the lascivious midst of a brothel scene, where semi-clad bodies writhe together and, at center stage, a middle-aged fellow has just consummated the pleasure of his purchase. So far not a word has been spoken. Then the aforementioned satisfied shopper steps forward, the set changes and closes around him and we are with the now-revealed Duke of Vienna in his chambers informing his deputy Angelo that he’s about to leave town for a while. Angelo, known for his moral severity, is to preside over the city with the Duke’s full authority. The short of “Measure for Measure” is that a young chap called Claudio, who has impregnated his fiancée Juliet, faces a death sentence for the unconscionable act of fornication. In the Duke’s absence, it falls to Angelo to see the execution through. When Claudio’s friends fail in their appeals to Angelo for compassion and mercy, they turn to his beautiful young sister Isabella, a novice nun, to take up her brother’s cause. Though Angelo initially remains obdurate, the girl’s comeliness begins to affect him and his thoughts lightly turn to lust. When he offers her a quid pro quo, her refusal only stimulates his drooling appetite. The rest of the play essentially deals with the clash between Angelo’s passion and Isbella’s resolute protection of her virtue. Meanwhile, the Duke, whose real intention was not to leave the city but to wander through it disguised as a priest to gain some administrative wisdom, gets wind of Isabella’s crisis and devises a solution. Where, one might ask, is the comedy here? It’s all in how you read and play it — the inflection of voice and posture, the timing, and not least the directorial imagination and daring to recapture the racy spirit of the Elizabeth stage. The text becomes, like a Mozart keyboard concerto score, a blueprint for embellishment. Except it isn’t words that are added, but stagecraft. If the Duke often gets top billing — James Newcomb cuts an engaging figure of paternal affection here — it is the sexually wracked Angelo who commands our interest in a way no other character can. In a performance of sly understatement and yet dreadful torment, Jay Whittaker paints Angelo as a fairly ordinary bureaucrat, a garden variety neurotic except for his stifling sexual repression. When sweet young Isabella lights him up, Whittaker’s Angelo simply can’t deal with this new feeling that has inexplicably, indeed involuntarily, risen. Director and actor milk poor Angelo’s belated sexual awakening for all it’s worth, and the naughty gags have the house roaring. Yet no less hysteria-inducing is Jeffrey Carlson’s Lucio, the town dandy who’s too glib for his own good, quick to slander and slow to consider any consequences. Carlson’s Lucio, strikingly caparisoned in an aqua suit and bowler, is a sort of unauthorized fool, freely taking potshots without a license to kill. But his every sharp-edged, tossed-away speech is a mini highlight. As for the distressed maid Isabella — she who informs her condemned brother that it’s better he should die than she lose her virginity to that awful man — Alejandra Escalante instills her with upright pride shaded by a certain component of sexual terror. In another borrowing, the Bard recycled the same device to save Isabella’s honor and trap the calculating Angelo that also stretches credibility in “All’s Well That Ends Well.” So I shouldn’t need to elaborate here. The Goodman creative team does a bit of recycling as well. 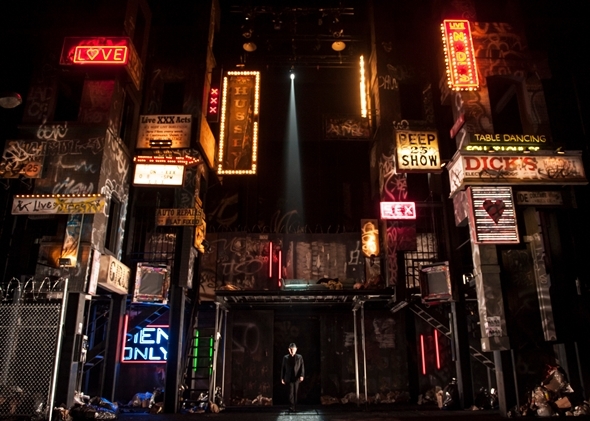 Set designer Walt Spangler’s garish, neon-studded red-light district strongly invokes the Goodman production of Tennessee Williams’ “Camino Real” from last season. So, from the same show, does Falls’ merry morass of half-naked grapplers and couplers. Well, why not? 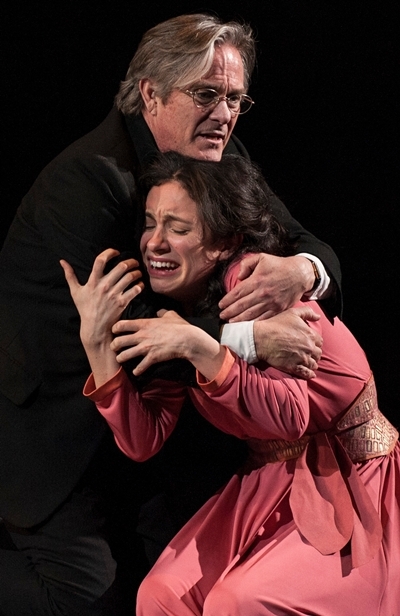 “Measure for Measure” is a great deal about not much. Angelo is hardly Iago, and the Duke is a bawd. At least Falls and company lose the black band of sobriety and give us a good laugh.